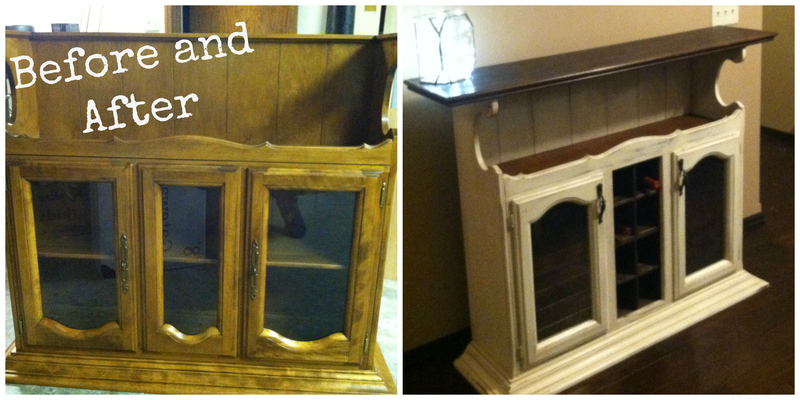 …..Because Every Home Needs a Bar! About a month ago my Momma found the top of a hutch on Craigslist for $35. That’s right….for the ultra bargain price of less than half my monthly gym membership I bought myself the start of a bar. It didn’t start out looking all that promising really, but things really started to take shape when we decided to flip in over. I know that sounds totally weird but hear me out. If I had used the cabinet right side up I would have had to build a base to go around the bottom feet and a top. By flipping the cabinet over I could skip building the base because the crown molding was already on the cabinet. This meant that I only had to build a top. Saving time and money is never, ever a bad thing! 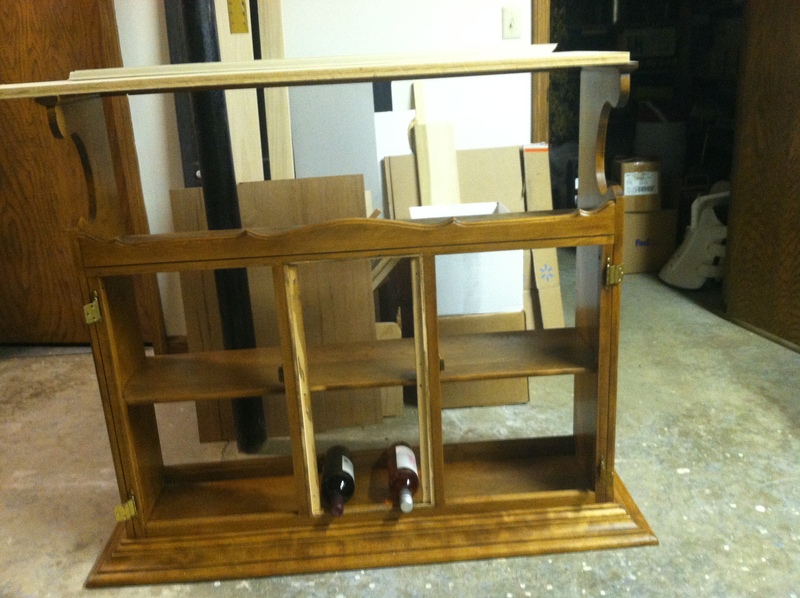 Also, it provided an extra shelf….extra shelves mean more booze storage! Step one was taking the back panel and all three glass doors off. The middle door had some recesses that needed to be filled around the edges, but I did that last to hide any nail holes. To make the top and the wine cubbies, I used edge glued pine. I ended up buying two 12”x72” pieces from Menards. 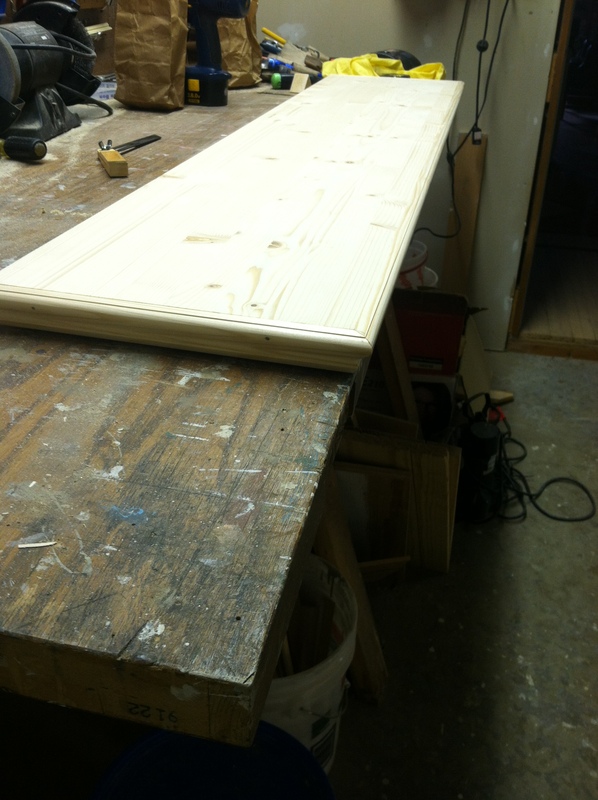 Additionally, I purchased a piece of 8′ molding to finish the edge of the top. Once I decided on a top length that balanced out the bottom of the piece, I cut it to length using a radial arm saw. 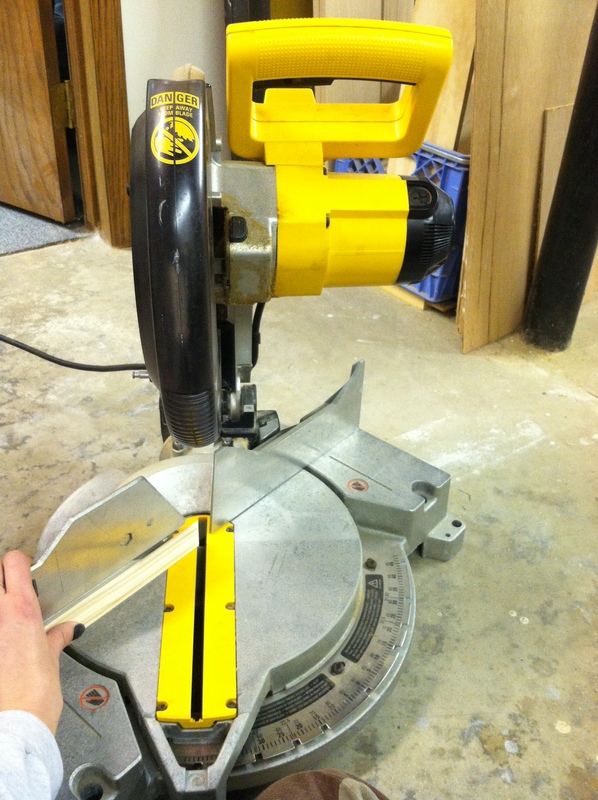 You could cut all the trim pieces using the radial arm saw, but I prefer using a miter saw. It’s super easy, you just click the blade over to the angle you need (45 degrees in this case) and cut away! Make sure you mind the manicure! Since I bought 8’ of trim and needed less than that for the project I decided to cut the angles and then trim the back sides flat. If you make the top longer and need to use all of the trim the measurements will need to be more exact. You’ll need to make alternating cuts on each of the front corners so that they fit together to make a 90 degree corner. Turn the blade to the right and cut the short side on the left hand side of the top. The front piece will need a left angle cut on the left side and a right angle cut on the right side. Finish off the trim with a left angle cut on the short right side. Once the trim is cut and you’ve checked the fit attach it to the pine top using wood glue and some small finish nails. Don’t forget to drill small pilot holes in the trim pieces for the nails before you glue! The top got two coats of stain to help protect it from any spills. Also to add some polish I buffed in a thin coat of Annie Sloan Clear Soft Wax. I’ve never done that before but it really helped smooth out the wood and sealed it nicely. Give your top a light sanding before you stain it. It will just help even out any ridges between the pine and the trim. To keep the wine cubbies from looking too bulky I had to plane down pieces of the pine. Using the extra from the top and the additional purchased 12”x72”, cut pieces to match the width and depth of your cubbies. My cubbies ended up being about half an inch short on the back side because my planer can only handle 10″ pieces and my shelves are closer to 11′ deep. No biggie, no one sees the back side! The edge glued pine started at about 5/8” thick. I planed that down to about half an inch. The actual thickness isn’t really ciritical, just continue taking small layers off until you reach a thickness that seems visually pleasing. I left the sides of both set of 4 and the bottom unplanned. They are hidden from view and are just for support. Using the radial arm saw again, cut a half inch grove into each of the 4 planed pieces. This will allow them to slip together. 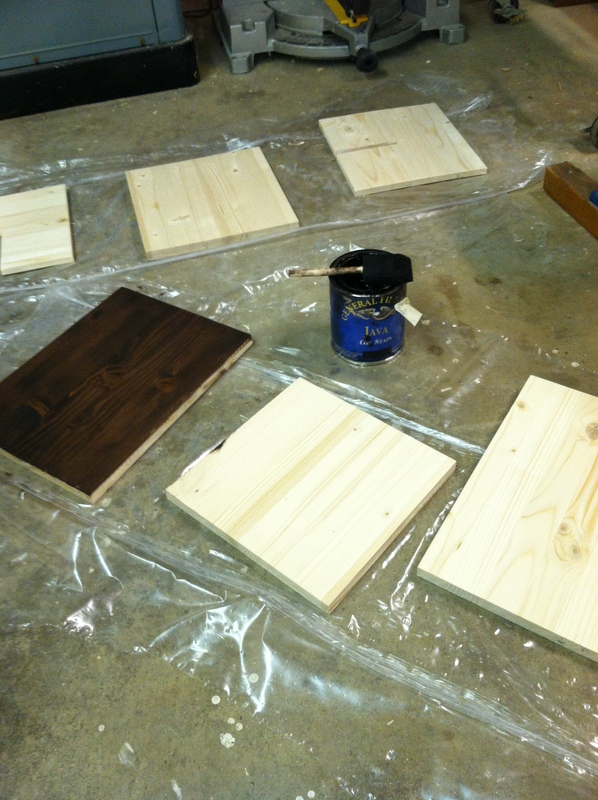 Before installing the cubbies, I recommend staining then. This will allow you to get into all the nooks and crannies. I used General Finishes Gel Stain in Java for the whole project. The best part is you can use this stain over any existing stain without using any strippers! Laziness wins again! I also applied a coat of stain to the inside of the whole piece just to darken it slightly. Don’t forget to stain both sides! Rubber gloves are a for sure must have for this. I use foam brushes to apply the stain and then an old sock on one hand to rub it in and absorb any excess product. I was on a slight deadline for this project because I’m hosting a party this week and the party needed a bar!! So…..my Momma got the cubbies installed while I was back home working all week. The groves slip together and then the crosses were installed as one piece. The cubbies are attached to the piece itself with nails through the front recessed area. Those nails were then covered with two small trim pieces. The crosses were screwed into the side panels and the side panels were glued on the top and bottom sides to the existing shelving in the piece. I decided to mirror the glass on the doors. This serves two purposes, it matches the rest of my home better and it hides all the random bottles of booze in the cabinet. It’s a simple process but it does take some time. To preserve the inside of the doors, bust out the painter’s tape and go to town!! Don’t mix up your styling products and your vinegar water kids! I’ve made several mercury glass style vases using the Krylon Looking Glass spray paint, but I had never tried making a solid mirror. To achieve some mild distressing I sprayed a 50/50 mixture of white vinegar and water around the edges focusing on the corners. Make sure you have room to lay the pieces you’re spraying down flat. The paint is very runny and if the pieces don’t dry laying down you’ll get run marks. I did 5 light coats total letting each coat dry in between. About halfway through the process I sprayed on some more vinegar water. This creates nice distressed bubbles. Concentrate the spray in an area if you want larger bubbles. After the mirror glass paint dries you can remove the tape on the back. Flip the doors over and tape the front of the glass so that you can get the doors ready to paint. I attached the doors back onto the piece before painting and distressing. I just find it helps keep everything even. I reattached the doors upside down also so that the curve of the wood was on the top of the door. Doing this meant I had to move the magnets inside to hold the door closed and rethink some exterior hardware. 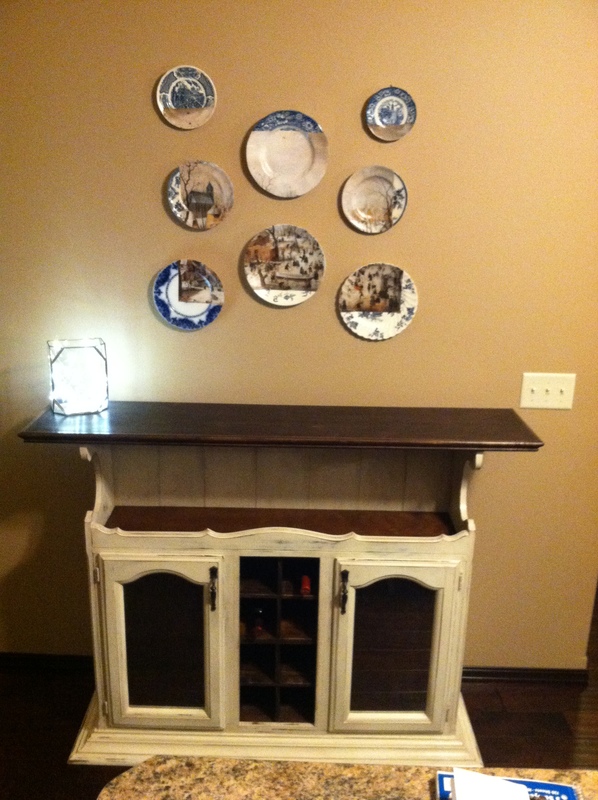 I painted the project using Annie Sloan Chalk Paint in Old White. Everything I have read about the chalk paint says that you should be able to paint a project in one coat; I’ve never found this to be the case. I’ve repainted a dinning room set, a small chest of drawers, and a bookcase and everything needed two coats. 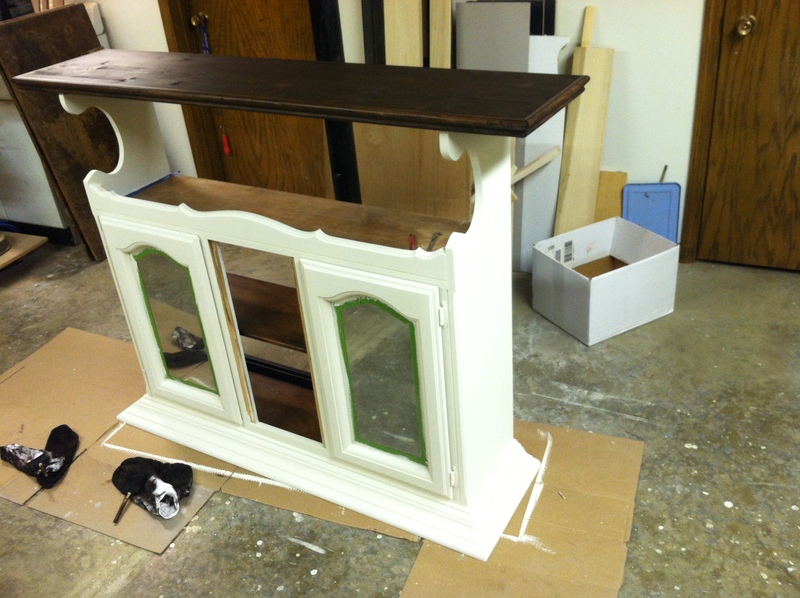 Two coats of paint, two upside down doors, and the top. After two coats of paint you’re ready to start distressing. I went over the whole thing with some fine grit sandpaper. This might not make any sense, but the sandpaper will sort of ‘tell you’ where to distress. It will naturally strip more paint off of the high points and corners. Anywhere the paint starts to distress, I focus a bit more. This is the part I hate the most because it’s hard to decide when enough is enough. Its helpful to take lots of steps back and assess the piece as a whole. I also did some light distressing on the large flat sides and the back panel of the piece. Its harder to distress large flat areas but just go until it looks good or your arm gives out….which ever comes first and I promise the piece will still end up fabulous! Once the distressing is done make sure to wipe of all the paint dust. A large paint brush works quite well for this. I did hit a small roadblock because the paint dust turned all my gorgeous dark stained wood slightly milky, but I discovered an easy way to fix that. We will talk about that in a minute. After you get everything cleaned up its time to start waxing. Honestly this is the step I hate because by this point everything looks finished, and you’ve put in all this time, and you just want to be done! However, the chalk paint is delicate stuff until its waxed and sealed. So, grab an old white t-shirt scrap, some gloves, and some Annie Sloan Soft Wax and buff it into the whole piece. The paint color will change slightly but don’t worry about it too much. I also made some dark wax by mixing a small amount of the java stain into a glob of clear wax. Annie Sloan makes dark wax, but I’ve mixed stain and wax for all the projects in my house and its always worked just fine. After applying a coat of clear wax you can gently buff in some of the dark wax anywhere you’d like some extra distressing. I use fine steel wool for this and find that it’s almost impossible to overdo it because the wool will really buff it out if you apply too much. The dark wax is a totally optional step!! 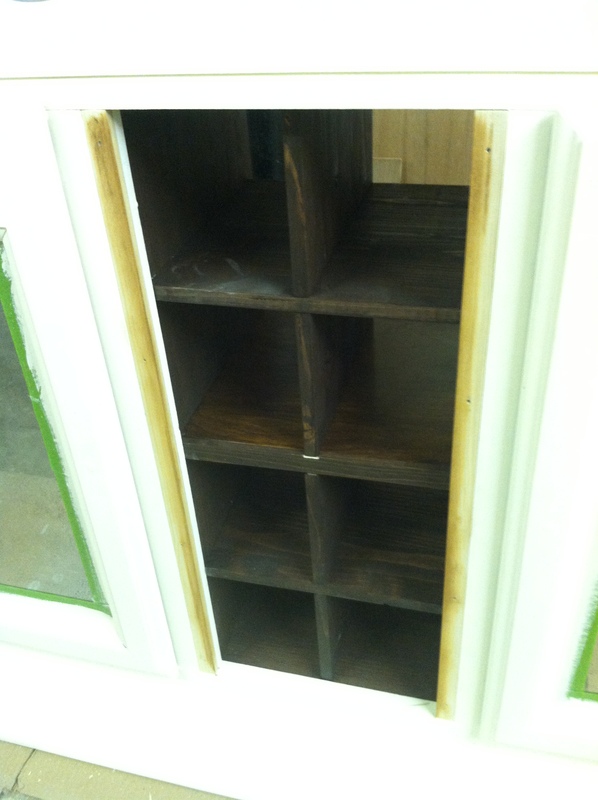 Also I used the dark wax on the wine cubbies to help remove the cloudiness from the paint dust! It was a total shot in the dark but it actually worked really well. This picture really shows off my whoopsy moment with the paint dust. Also the oddly stained pieces were applied last to cover the recessed area where I had attached the wine cubbies. Those two pieces were painted and distressed with the rest of the piece. The stain was applied to try and take away the unfinished wood look…it didn’t really work and I’d probably skip it if I had to do this again. That’s pretty much it! 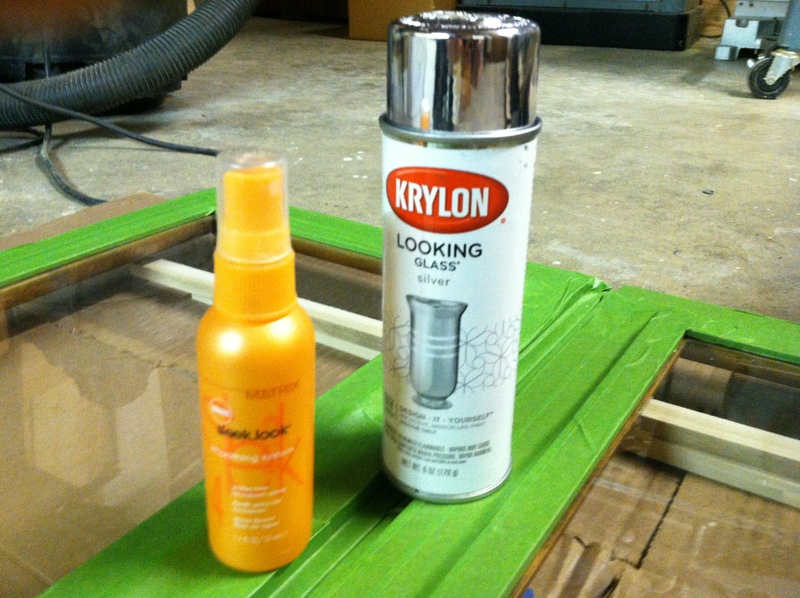 Allow the wax to cure overnight and reattach the back panel using small nails, screws, or a staple gun if you have it. I attached the top to the piece with three small screws along the back side. I salvaged new door pulls from Momma’s garage. She had a bag of pulls from the kitchen remodel when I was a small tot and for some reason they were still laying around. They were kind of a gross 80’s brass….barf…..but a coat of oil rubbed bronze spray paint darkened them up nicely. Drill some holes in the doors and screw those puppies in an you have a completed piece! Overall I would rate this as a moderately difficult piece. I have the added benefit of having grown up around power tools and wood working. My Dad basically built all the cabinets, doors, and trim in our house so I already had all the tools needed. Momma and I have a good handle on all the basic skills we needed to build this piece. If you’re less experienced or feeling iffy about tackling this much work you could always leave out building the wine cubbies, just paint all the doors, and lay the bottles down inside on the shelves. Also, if you have an extreme aversion to power tools, home improvement stores will cut lumber for you so if you know the length you want to the top to be and don’t want to trim it that would also be an option for you. All set up in the house and ready to party!